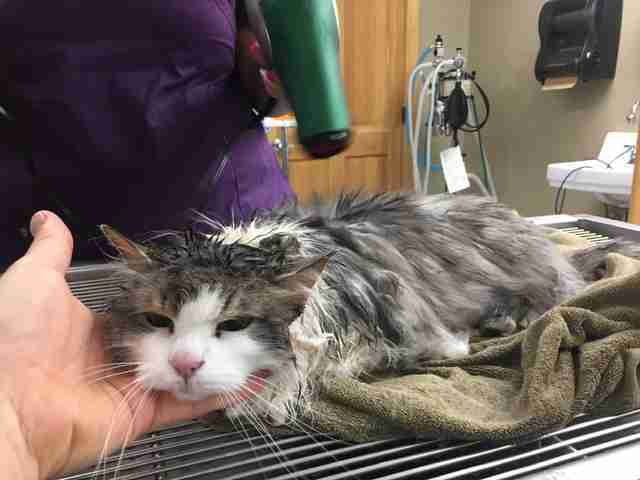 The indoor-outdoor cat had ventured out into the cold Montana air last Thursday while her family wasn't home, and in the process, somehow got injured and couldn't get back into the warm house. The frigid temperatures quickly overtook her body, covering her in thick layers of snow and ice as she lay waiting for help out in the yard. "They've always been great pet owners so they didn't hesitate to bring her straight here," Andrea Dutter, executive director of the clinic, told The Dodo. "It was all hands on deck. We had both doctors here working to thaw the snow and ice off her with warm water, and they were also blow-drying her and rotating in warm towels from the dryer." While Fluffy had a heartbeat when she arrived to the clinic, her body temperature was too cold to even register on the doctors' thermometers. It took nearly an hour of warming the cat for her to be able to move. While it's unclear what exactly happened to Fluffy that stranded her outdoors, Dutter said it's possible she was harmed by another animal. She had marks on her skin — but luckily, won't have any lasting impacts from the injury, Dutter said. "She was with us here for a few hours and then spent the night at an emergency animal hospital to be monitored," Dutter said. "By the next morning, she was already doing well and walking." After Fluffy's chilling near-death experience, her family has decided to limit her time outdoors. While she may miss exploring the yard, she'll likely have plenty of opportunities to go out with her family when it warms up. 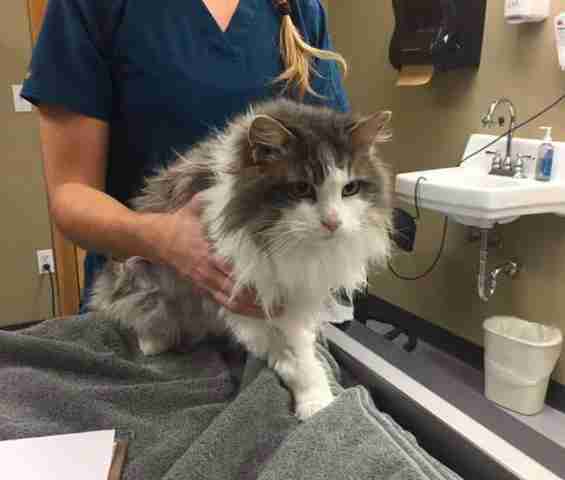 "Her owners are new to the area and when they first bought their house, Fluffy was an outdoor cat already living there in the backyard," Dutter explained. "She was established out there at that point, but after they started taking care of her she began living half indoors." For now, Fluffy is cuddled up at home in a nice warm bed with blankets — and given what she's been through in the past week, that's probably where she'll want to stay for a while.